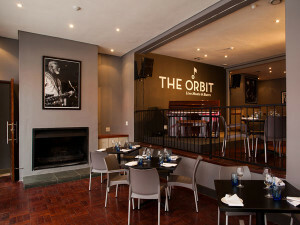 Guests often ask where they can listen to jazz in Joburg and of course the Orbit in Braamfontein is the first place to go. Being in Braamfontein in the heart of the student area, there’s always a great buzz here. There’s jazz every night from 8.30. Also check their Science and Cocktails on the last Tuesday of every month. It’s a brilliant initiative. 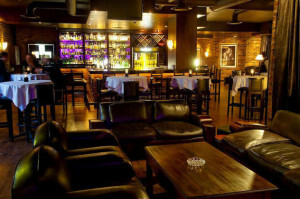 You can also check what’s on at Katzy’s in Rosebank where the rich and famous hang out. Sharing a menu with The Grillhouse, one of the very best steakhouses in Johannesburg, you can always get a good meal. There is quite a hefty cover charge. And one of the oldest pubs in Joburg, the Radium Beerhall in Orange Grove (not the most upmarket art of town) has jazz every first Sunday. They serve fabulous Portuguese food – their chicken peri-peri and their chicken livers art to die for. 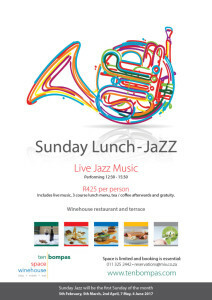 For mad foodies and those that love their jazz, First Sunday Jazz at Ten Bompas Rd is a real win. 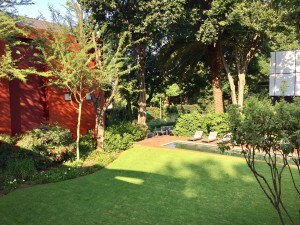 Enjoy a three course meal in the gardens while listening to chilled jazz. At R425 a head it’s not a cheap event but it’s incredibly good value when you’re converting from US dollars or British pounds! Ten Bompas Rd is 4 blocks from Liz at Lancaster so drinking and driving is not even an issue. ‘One cannot think well, love well, sleep well, if one has not dined well’. I recently attended a Social Media course run by Writer’s Write and the venue was Ten Bompas Rd. So I was able to experience at first hand some of the food that guests rave about when they have dinner at Winehouse. I had the most superb fish, beautifully presented and the roast potatoes (3 times roasted) were sublime. 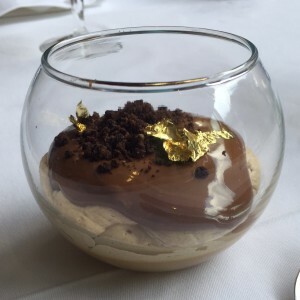 The chocolate mousse complete with gold leaf looked decadent beyond belief and the cheese board was also a visual (and gastronomic) delight. Dollars and pounds? What about the locals? What an inane comment!